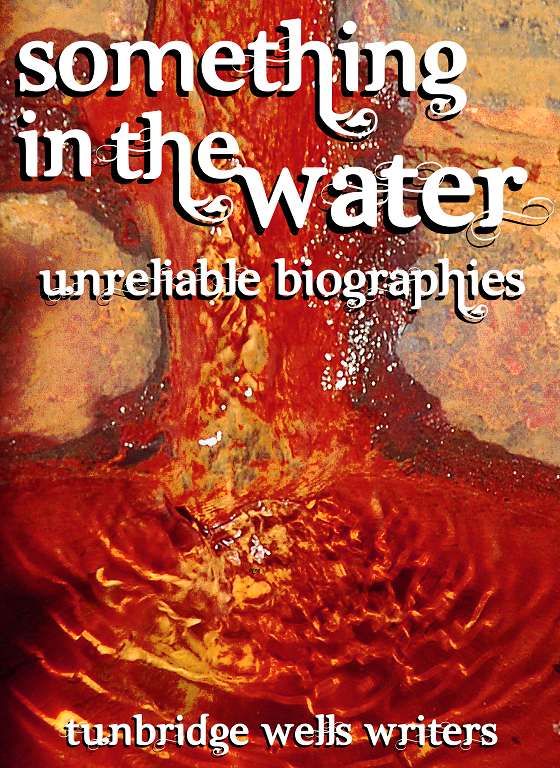 I just finished designing a cover for an ebook by the Tunbridge Wells Writers – Something In The Water, an upcoming collection of “unreliable biographies” of historical figures related to Tunbridge Wells – and it got me thinking about how cover images work in an age of electronic publishing and internet retailing. In the dystopian horror carnival of Geordie Shores and Deals and No Deals and Ants and Decs in which we now live the traditional book cover is dying. It’s not like back in the long-forgotten pre-Kindle past of 2006 when books – real, solid, lumpen books – would sit on shelves all gaudy and alluring, their bright covers and spines calling you towards them like a series of illegally trafficked Bulgarian women forced by a Slavic pimp to drape themselves on the low, stained sofa of a Chatham knocking shop. No, the brutal world of bookselling today is all about thumbnails. Rows of postage stamp-sized images that sit desperately alongside ranks of hyperlinks, stars and prices printed in struck-through font, too small to convey anything substantial but there nonetheless. Special offers, reviews, recommended for yous, star ratings, customers who bought this also boughts, look insides…these are what influence the modern online buying decision. Sure, most of this happens with physical books and physical book shops, but I’d argue that when browsing in a bookshop the cover is what compels you to pick that book up and look inside. For online shopping, however, I’d argue that it barely moves the needle. The cover is part of the book’s brand – it affects how we feel about the book, it sets our expectations before we even open it – but when it’s diminished to the size of a postage stamp in an online shop, it’s concomitantly diminished in importance. And that’s just the buying part. On an e-reader (other Kindles are also available) I don’t even look at the cover of a book once I’ve bought it; I’ve made that decision, now I’m going to read the text that I’ve paid to obtain – which means I virtually never see the cover again.With print books you see the cover every time you pick it up, but an e-reader automatically opens at the page at which you were last. With an ebook, the cover ceases to contribute to the book’s brand once you’ve got to page 2. Despite this, the book cover persists. But for how long? We don’t buy the cover, we buy print; we buy the plot, the characters, the prose. With a virtual book there is no need whatsoever for a cover. It’s an electronic file sitting in an electronic device. There is no cover. While I don’t think that print books will disappear any time soon, I do think they will become less prominent, and that electronic books will become the normal way of consuming print content. In which case, the cover image is a dying art form. Or rather, it is an evolving art form…as I think that instead of going away it will adapt to meet the new requirements that are being placed on it.